Administrators can always add users to the firm account. Individual users may be able to register with the eFileManager system and add them selves to a firm account if the firm allows this. After logging into www.filetime.com, click the Admin tab at the top of the page (Figure 1, A). Click the Firm Users button (Figure 1, B) on the sub-navigation bar. Click the Add User button (Figure 1, C). 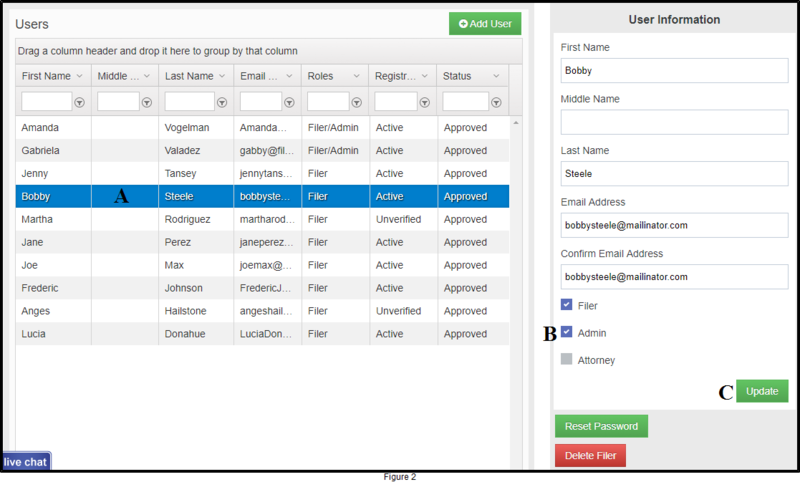 Let FileTime guide you through the process of adding the individual. eFileManager will send the new user and Account Activation email. This new user will not be able to login to FileTime until he/she opens that email, clicks the Activate Account link. She/she can then login using the password contained in the email. 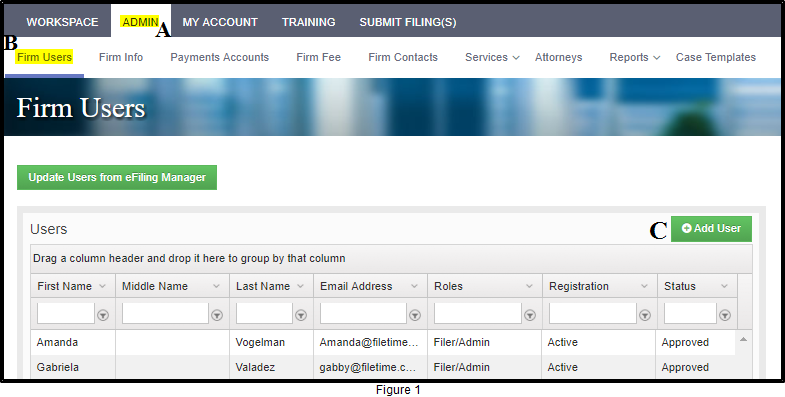 If the new registrant need to have Administrator privileges, find his/her name on the Firm Users page (Figure 2). Click on the name to highlight it and open the User Information section for that individual (Figure 2, A). Click the Administrator check box (Figure 2, B)and then click the Save Changes button(Figure 2, C). A firm can allow firm users to register themselves to join the firm account. An administrator logs into FileTime and clicks the Admin button (Figure 3, A). By default you are taken to the Firm Info page (Figure 3, B). Check the Allow Users to self-register for this account option (Figure 3, C). Click the Save Changes button (Figure 3, D). 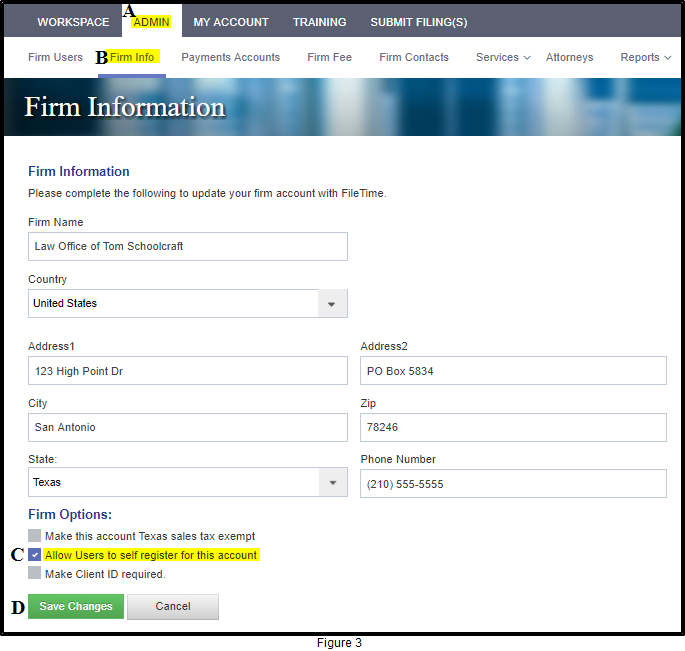 The firm member goes to www.filetime.com and clicks the Register button (Figure 4, A). From the drop down menu of the Register button (Figure 5) click the Join an Existing Firm Account button (Figure 5, A). Let FileTime guide you through the registration process. If during the registration process you receive an error message that message that your email address already exists in the eFileManager system, you are already registered. All you need to do is login at www.filetime.com with this email address and your password. Contact our support team at 800-658-1233 or support@filetime.com if you do not remember your password.